The romantic era of the ’70s fashion was all about freedom, a variety of colors, eclectic looks and a tendency to mix and match different styles with each other. It’s the period of the simultaneous existence of several styles in the fashion industry and the decade when the subcultures of hippies, punks and bohemian chic style followers emerged. Some fashion people love this era for its liberalism and the endless creativity at times even leading to little craziness, while others criticize the seventies fashion because of the apparent absence of any style rules and standards. Still, the seventies style is much appreciated for it became a means of expressing the individuality of a person, her unique vision of style and creativity. Bringing such mainstream trends as boho-chic vibes, folk, gypsy, hippie, ethnic, retro, classic, disco, safari, military, sporty chic and unisex fashion, the seventies fashion era can be rightly called the most diverse and vibrant decade in the history of fashion. Despite the fact that seventies are regarded as “anti-fashion’ and the decade of “a bad taste’ by some people, many world-famous designers constantly revisit this era, bringing back the aesthetics of the ’70s spiced up with a modern twist and presenting luxurious renderings of the key garments, styles and details defining this trend. Today, modern fashionisers try to invest in specific items recalling the seventies mood, this way managing to build up personality-stating and bright looks that can hardly pass by unnoticed. Coming back every once in a while with a stronger power and an intention to stay, this fashion epoch arouses interest in more and more fashionisers, who try to find out how to wear the ’70s	fashion trend correctly to radiate the same effortless chic and careless mood and make a big sartorial statement! Exactly the 1970s marked the beginning of significant changes in the industry of fashion. The era started with characteristic trends and details borrowed from all the previous decades, including geometric cuts, form-fitting silhouettes, bright colors, the co-existence of mini and midi skirts, a big diversity in fabrics and trimmings, each of which later formed a particular style in fashion. You could wear anything at this period from cheap cotton dresses with a relaxed style, ethnic patterns and hippie fringing to luxurious couture designs. Even though refinement is the first thing that may come to your mind when recalling the modern seventies, they still carry certain fun and exciting motifs of a carefree style, which never looks cheap. These are the main details defining the ’70s fashion trend! Unlike the glittery twenties or the psychedelic sixties, the 1970s fashion is all about timeless and mild earth tones, from various shades of brown and cream to khakis, gold, sunflower yellow, sand hues, antique red, denim blue and Lilly orange. In the modern world, designers decidedly enlarge this color palette giving more sophistication and interest to their designs. And since the seventies are all about eye-catching and bold looks, mixing and matching such shades with each other boldly is highly recommended. Coming to spice up the warm earth shades, various vibrant kaleidoscopic prints and patterns are often used in the seventies style too. Think colorful brushstroke prints, geometric motifs, ethnic patterns, checkered prints, audacious abstract and floral designs. Each of the distinctive styles of the seventies stands out with its unique color and print palette, which all have something in common to be united under the same decade. Utterly romantic and sensual, these details are mostly characteristic of the boho-chic style of the seventies fashion, appearing on dresses, tops, vests and other clothing pieces. It can be some small detail attached to a matching or contrasting fabric and looking fresh and extremely fanciful. Quite often they come accompanied with sparkling beads, jewels, eyelets and silken threads, which surprisingly never look too much to the eye. Perfectly tailored simple silhouettes and A-line designs are still characteristic of the 1970s fashion, even though there also co-exist those flowing and relaxed shapes of the hippie and bohemian fashion. Such minimalist shapes and silhouettes surprisingly manage to show off a high dose of elegance and femininity. Quite a lot of pieces are made of the most popular synthetic fabrics. Besides the synthetic materials, suede plays an important role in the ’70s style too, looking soft and delicate and being used not only for the accessorizing details such as shoes and bags, but also acting as a primary material for dresses, skirts, tops and outerwear designs. The shapes still adhere to simplicity in this case with details like patchwork or fringe acting as elements for boosting interest. Expect to see lots of fringes and tassels in the seventies style, decorating either bags, shoes and other tiny details or an entire piece of boho-chic clothing, such as a maxi dress, a cropped jacket, a poncho or a pair of wide-legged pants. Picking a fringed accessory you can always team it with other styles easily, while an entire fringed outfit will help you to easily create a bohemian or hippie style. High waists are perhaps the first things that come to your mind when thinking retro and this is so true about the lovely seventies style too. 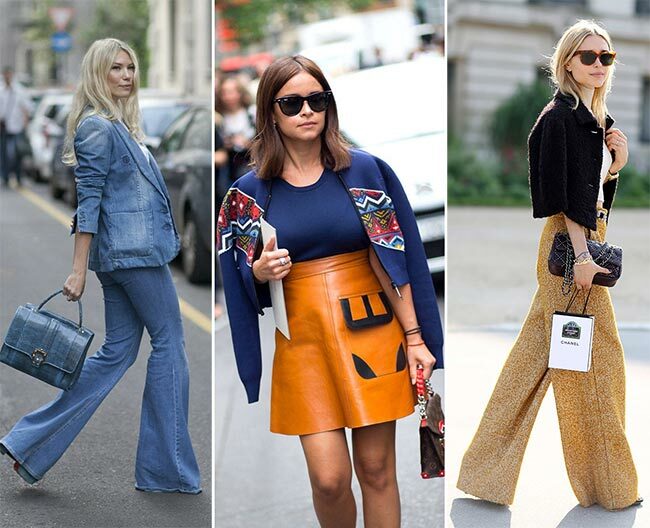 Whether that’s a mini, midi or maxi skirt or a pair of jeans, pants or shorts, give preference to high waists if you want to easily create a seventies mood in your images. Such garments are best to match with slim-fitting tops in order to emphasize the waist design of the bottoms. Timeless denim has a lot in common with the 1970s fashion. Available in a variety of designs and color washes, denim clothing pieces scream seventies. Especially cool are those high-waisted bell bottom jeans and the hippie style ones with various appliqués, patchwork and embroidery. In addition, you can opt for denim skirts, especially midi or maxi ones with buttons on the front, chambray shirts, denim vests, jackets and dungarees. Denim can also be used for footwear and bags to give a seventies flairs to the designs. In the 1970s minis slowly gave way and midi and maxi skirts and dresses gained a huge popularity. However, there were still big followers of fancy mini skirts, which mostly came with high waists in this epoch. Nowadays, flowing maxi dresses and skirts come in a variety of styles and fabrics and can be worn both on a daily basis and to special occasions. It’s not just the bell bottom jeans that are typical of the seventies fashion, but also any type of flared pants, whether hip-hugging flares or dramatic bell bottoms. They can be matched with form fitting tops, peplum or flowing sheer blouses and in all the cases flared pants look highly elegant and feminine. The pant suit gained a big popularity in the beginning of the decade, coming to revolutionize the modern woman’s style. While it was always considered to be a wardrobe basic for men, slowly women also started to wear pant suits and three-piece suits, matching them with strict or flirty feminine shirts and scarves. The majority of the designs featured bell bottoms, but there were also slim-fitting styles. If you want to embrace the seventies fashion at the office, the pant suit is the best staple you can opt for. Whether monochrome or printed, the matchy-matchy sets came to be the most effortless and easiest outfits for looking chic on any occasion. Pants, skirts and shorts with matching tops look really amazing and they require so little in terms of styling. Overalls are also typical of the seventies fashion, no matter it’s dungarees, rompers or dungarees dresses. They can be worn practically with any style of tops, both extremely causal and something elegant, depending on the overall impression you want to create. Another typical seventies style garment is the turtleneck sweater, coming in a myriad of colors. They mostly look slim-fitting and can be worn with any other clothing piece, including skirts, jeans, pants, shorts or overalls. Turtlenecks can be rightly considered seventies wardrobe must-haves. The peasant blouse is another typical seventies style staple, which is all about a relaxed and effortless look. Peasant blouses can feature beautiful embroidery or ethnic patterns, romantic ruffles and frills and they look amazing in combination with jeans and short shorts. 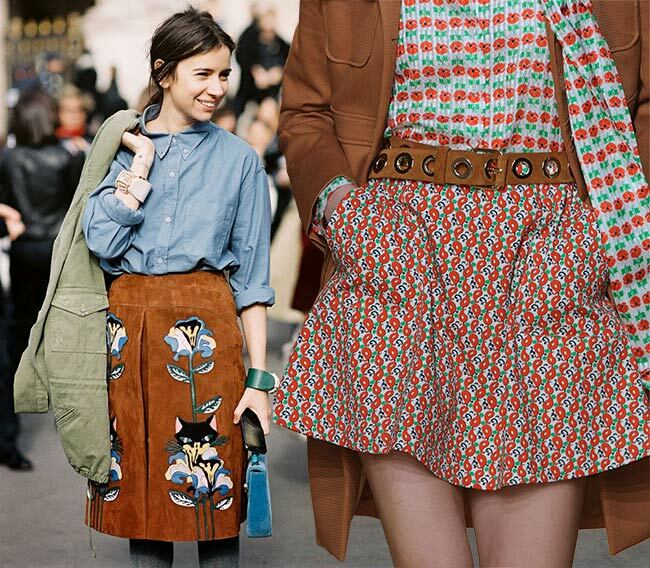 In addition, you can opt for peasant dresses and skirts to look romantic and in the retro seventies style. As for the typical ’70s fashion accessories, you can opt for wide-brim hats and oversized retro sunglasses, as well as handbags featuring bold tassels and fringes. In terms of footwear, platform shoes and sandals mostly with wooden platforms are the best, while boots should come with low heels and a square nose. Chunky heels are the way to go! All the classy ladies will especially love this style in the 1970s fashion, since it’s all about understated elegance. Everything elegant from the pant suit and crisp A-line silhouettes to a laid-back uniform and a classic coat with sharp lines will do in this case. You should only give preference to rich fabrics and clean and minimal silhouettes, as well as stick to the classic color palette including white, blue and red. While monochrome is the way to go here, you can always spice up your looks with a printed shirt tucked inside the pants. Platform heels and oversized sunglasses can become amazing complementing details. The extremely carefree and relaxed boho-chic style represents the next lovely aspect of the seventies fashion trend. In this case, you should opt for everything flowy, billowy, lightweight and maxi. Experimenting with rich prints and patterns, florals, paisley and tie-dye is highly recommended, and when it comes to styling keep things as natural as possible. This refers to the hair and makeup as well. To thoroughly embrace the freedom and eclecticism of the trend you can opt for ’70s inspired hippie-chic silhouettes, which are ideal to wear on a daily basis. Simple cuts, colorful retro patterns and above-the-knee lengths are what describe hippie-chic in this era. In terms of accessories, you can pick gladiator sandals, suede ankle boots and scarves. Makeup should be kept minimal, while center-part natural waves are the best to give a refined, laid-back touch to your look. Hippies were also the originators of the folk style in the seventies fashion, characterized by natural fabrics, bright national patterns, embroidery, lace, fringe, patchwork, appliqués and long and loose silhouettes. Traditional costumes of different nations are extremely popular in this style. A type of the ’70s folk style is gypsy that is all about ruffles, frills, chiffon, long dresses and bright patterns, including florals. On the other hand, we have the Scottish inspired motifs, which seem to never get out of trend: think clean lines, tartan, short lengths and handmade jewelry. The Native American references are also huge in this trend, represented by traditional textiles, graphic prints, and playful fringes. The poncho-inspired dress with fringed hems and colorful patterns is very typical of this style. In terms of accessories, go for neo-bohemian jewelry designs, moccasin boots or gladiator sandals with fringe accents. On the other hand, we have also the “modernized’ American folk style, where the turtleneck, shirt-dress and elegant pleated dresses are the key elements. Last but not least, we can mention the refined European folk motifs like the typical French romance and elegance, and the typical silhouettes describing the Eastern culture, especially Japan, including wide sleeves, kimonos, oversized silhouettes, layering, wide shoulders, and bright prints. Safari and military influences took the lead in the second half of the 1970s. All sorts of details and garments characteristic of these styles came to fashion, from the typical khaki and sand color palette to wide leather belts, patched pockets and casual silhouettes. These styles have always enjoyed a big love, which is why they constantly come back to fashion. Aerobics began to enjoy a big popularity in the seventies, which led to the popular sporty chic style. The range of casual wear was enriched with sports jackets, sneakers, jogging suits, caps and tees. Today, ’70s inspired sporty chic is perhaps the most popular of all the other style directions, since nothing can compete with its comfort and versatility. The most extravagant and “sparkling’ of the ’70s inspired styles is the disco fashion, which encourages all the glittery and bright color combinations, being the best option only for evening wear. Neon colors, tight pants, short shorts, granny dresses with small flowers and modern ones with deep cuts, transparent blouses embellished with sequins are all in when it comes to the ’70s disco style. As for the complementing details, you are welcome to go for towering heels, especially platform ones, and massive glittery jewelry pieces, while bright makeup and shaggy hair can perfectly finish off your look. The ’70s inspired glam style was born on the rock scene, but has got massive attention in fashion and design ever since then. Blurring the boundaries between sexes through the use of “female’ elements (shiny fabrics, bright colors, sequins, feathers, sating blouses, ruffles, tight pants, platform shoes, makeup or dyed hair) in the masculine clothing it gave birth to the unisex style in the seventies fashion. In the late ’70s fashion was strongly influenced by the punk subculture that had emerged in the UK. Everything was designed to shock and show the wearer’s protest against the society. The ’70s punk fashion encourages wearing military uniforms, ripped and torn clothing pieces, tees with some messages on them, leather jackets, mini skirts with black tights and high heels and bold makeup. In terms of accessories, give your preference to silver metallic designs, especially chains. 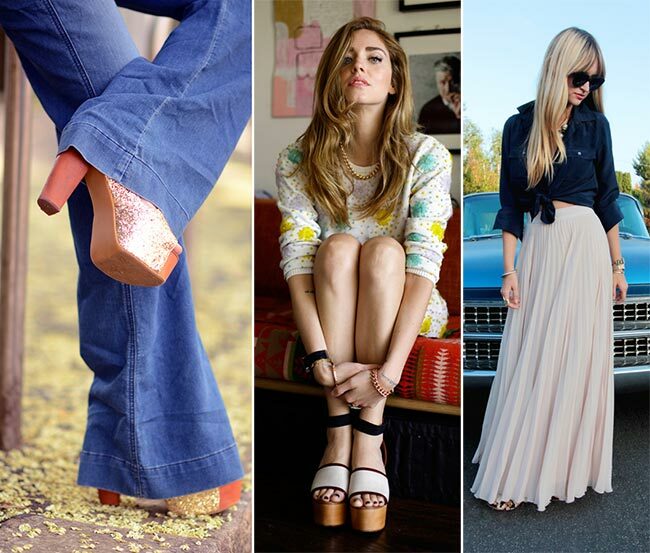 It can be really tricky to wear retro trends especially the ’70s, which are so diverse and different. However, if you stick to the best ’70s style that describes your personality and incorporate the key details describing it you’ll definitely manage to look like you have just stepped off the runway without looking awkward or making any style mistakes.